I'd like to congratulate my friend, and resident Food Wishes beer consultant, Jesse Friedman, who has recently taken the plunge into the wild and wacky world of self-employment. You may know Jesse as the publisher of Beer & Nosh, but very soon, you'll also know him as the wildly successful co-creator of Almanac Beer. By the way, if you're going to quit your day job, and say goodbye to all the safety and security it affords, then having lots of craft beer around is probably not a bad idea. 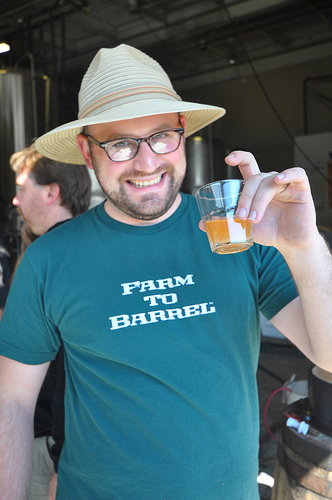 After years of hard work and experimentation, Jesse and his partner Damian will be officially releasing their "farm to barrel" brew on Thursday, June 30. I had the pleasure of tasting some this spring, and was quite impressed. I've just returned from LA after three grueling weeks, and way too tired to come up with the appropriate adjectives to describe the beer, so instead I'll simply invite you to watch the video below, and then give the Almanac Beer blog a visit for more information. FYI: I'm back in the kitchen tomorrow and should have a long overdue video recipe up by the end of the day. Stay tuned! So excited to try this much-anticipated brew! Congrats, Jesse -- wishing you unimaginable success! And thank you for your TV comments... who knew you could be stalked by something like a TV show ;-) Don't worry though, I'm getting a restraining order.